The astounding thing about the God of the Bible is that He uses His very creation to express himself. He points to parts of it to get our attention, illustrate points, and tell parables. So when people and their instutions deny any solution to origins that points to God, it either makes Him a liar or a lot of people believe false ideas. Is it really that extreme? If one of God’s primary means of expression (to show lessons from His creation) is denied validity, then is He valid at all? It is worth thinking about. It is my observation that most institutions, which are made and run by people, hold to a world view where nature has become the object of importance rather than the One who created it. Any notion of God is no longer permitted in most circles that I am aware of. How about a simple tree? 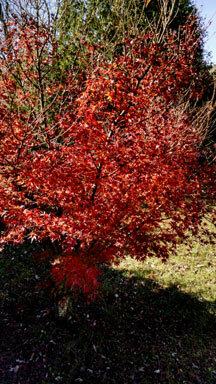 Here is a small sapling in Autumn. It sits by a little ditch so it’s root structure always has moisture, even during a dry time. God opens a section in the first Psalm by talking about a person who delights in Him is like a tree that is by streams of water. But if the tree evolved on its own from nothing by purely undirected chance, it makes God a fool and a deceiver, because He is teaching a lesson that has a false foundation. 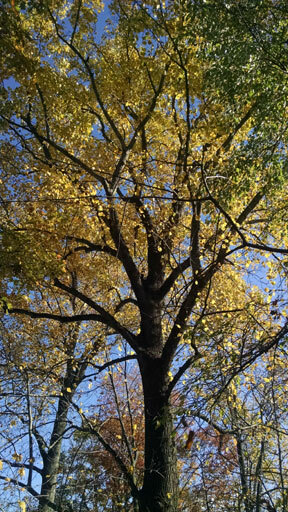 How about the mighty branches of a tulip poplar, which is a well known tree in my area. It seeks water, and large examples are invariably found where water is plentiful near the surface. 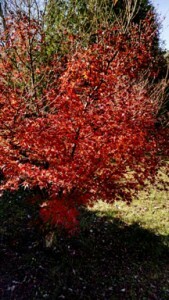 This tree is on the down slope of a small hill that has rock under the soil. Most water stays near the surface, which serves to feed this tree and a line of them nearby. Psalm 92:12-15 is where God expresses that people who are righteous (which means they have a right-relationship-to-God) flourish like a palm tree. Palm trees do the same thing as this tulip poplar…they thrive near water. So if a tree simply evolved from pond scum that evolved from primordial soup that evolved from really really smart star dust that was always there, then the idea of being righteous in relationship to God becomes a foolish and absurd lesson, because the tree has nothing to do with God. That is what your children are taught: God has nothing to do with trees or just about anything else around them! That is what most universities state in so many words! It is called naturalism and comprises the dominant world view of the world around us. In Genesis there is a “story” about an ark (a large wooden ship) that was constructed to save one family from a world wide flood. It was made of wood. Wood from trees still provides the material for all sorts of things. 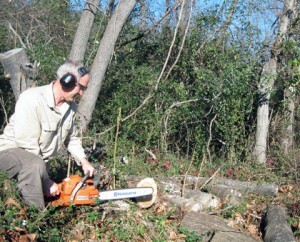 The image shows me cutting wood for heat. God says the trees were created that were pleasing to the eye. They were made to bear fruit. He even said that the first trees that filled the earth on His command during that third day of creation were “good” (Genesis 1:11-13). In later years, men of old took sticks and made figures and worshipped them, which God took note of and called it idolatry, because they had already lost sight of the very Creator who made the trees. Today, in a similar fashion, we make nature a god to itself to the extent that we often give it more respect and right than a child in the womb, much less perceive that our natural surroundings are truly a result of His hand. Of course, any mention of the ark, the flood of Genesis, the reason for the flood, and its longer term effects are, in most cases, considered foolishness. If today’s popular axioms about the world around us are true, origins did not occur as God said. That means any mention of God or referral to His creative hand is generally considered faulty thinking. It follows that the Bible is false, men never sinned with respect to Him at the beginning, Christ is not needed to save anything, and believers in Him are fools of fools. It is a sobering thought that many countries will now take legal action against a teacher or professional if they openly declare that the God of the Bible created the universe, much less sustain it and give us life. But what do you think? Do you dare to believe that time and space created itself, that masses of energy and matter self organized, that life appeared through chance encounter, and that your ancestors were morons but we have gotten smarter? Really? Then, indeed, parables about trees, weather, seed, pearls, animals, or even people are lies based on a Creator God Who does not really exist. It follows that the Bible is myth and the Kingdom of God a notion of the worst kind–giving false hope to those who seem to be lost. Are you prepared to deny Him that way? Or, if you sort-of believe He really exists but suffer your children and children’s children to be taught that God has no place in the world around them, do you really believe if you say nothing different? The next time you look at trees that are especially striking to you, consider these things. God beckons people by using His creation as an undeniable signature, and trees are just one little tiny part of it. Would you dare to believe that He did it all, and draw close to Him? He can, I repeat, can be approached. His creation points to Him. Do not worship what you see. Rather, know that He made it from the beginning. The complexity we see is part of His signature. Where does it stop? …the design of the leaf, the processes of the leaf, how the bark is designed, how the fruit is produced, how they vary but are still trees since creation, how they form a forest, how they interact with water and sunlight, how their “code” was written? For the record, I am passionate about science and observing the world around me. I don’t avoid science, but good experimental science has validity because the created universe has a system of laws and things that were created by His hand. He beckons us to study it and invites us to let it point us to the work of His hand. Ultimately, it points to Him. For more information on the biblical view of creation and how it compares to evolution or naturalism, visit a site like creation.com. If you want a basic bible study on the same subject, you can download the Creation Study on the www.cwm4him.org site where this short article is located. Go to <courses> then <downloadable courses>. There is no cost or registration. It takes up 1 Meg and can be downloaded to most smart phones or tablets alike. Tagged Bible, creation, creator, evolution, naturalism, trees, universe.